Interesting times down the local Hammam this morning. Cultural interaction, this being a local rather than tourist bath house, was fascinating. Women whom we would think prudish because they wouldn’t walk down the street in a skimpy top and shorts found our female Western insistence on wearing a top in a wholly female bath house weird and prudish. So what is, actually, “prudish?” what is “natural?” Another conversation with someone local who had been to London posed a question —“why do you need millions of security cameras in England? Here, most people, most of the time, know God will be angry with them if they steal, so they don’t” — a naïve point of view, perhaps, but indicative of another cultural gap? Back to the Public Bath House. 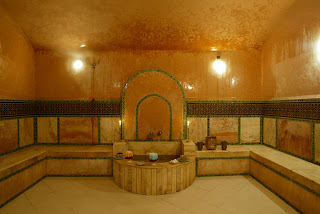 Hammams conserve water and combines the advantages of a shower and a bath — you open your pores and relax like a bath with steam (aided by gommage = mud scrub if you want) but refresh and get rid of the dirt like a shower. The whole notion of a community bath house is a bit odd to our very privatised Western sensibilities. Being bloky and throwing water over ourselves was a lot of fun and we all wish we'd taken the plunge (except there isn't a plunge to take) earlier in the week. I came away feeling that how we interpret and understand gender are the finest tuned most personal bits of our cultural conditioning, and the easiest to get wrong. Absolutising them is ridiculous. They live within our comfort zones and evolve all the time. It’s all too easy to assume we know that the other person is being liberated or oppressed when all they are being is themselves! Observing gender interactions in an Eastern culture also throws some of the context of the Bible into perspective, as a near Eastern text. To respond to God in others, we need to listen carefully, reducing our interpretative filters and assumptions to a working minimum, defocusing on our own reactions and respecting their provisionality. We need to express ourselves openly but courteously, suspending our disbelief about the other person’s culture. Then we need to draw gentle and provisional conclusions. That’s how cross cultural sensitivity works, and seeing the different strategies people have for straddling cultures, it’s plain Christianity in an open Cross-cultural environment feels very different to the way it does from an Imperialistic ( = Chauvinstic and standardized) standpoint. Early Christianity grew best at points of cross-cultural intersection, the open ports and trading system nodes of the near East; so an age of globalised communications should be fertile soil for the authentic article... What has to change in us for this to be the case? Came across a fascinating example of this at theological college in the 1980s. Another ordinand had previosuly been in charge of a hostel in Birmignham while a post graduate. 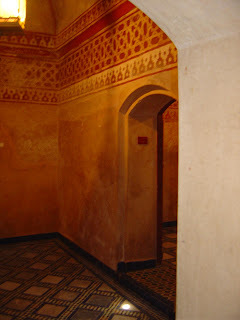 Many of the residents were Muslims and the hostel only had baths. My friend lobbied hard for showers to be installed but the Christian management committee couldn't see the need. Why the need for showers when you can have long hot baths? Why would you want to soak in dirty unclean water? Eventually the matter was resolved and the key issue was one of hospitality and recognition of the need of the other. It was a real missional and pastoral issue as two cultures and faiths encountered each other over a very basic, practical matter. Alongside the fact that showers are much more water and energy efficient and environment friendly, but that wasn't really seen as an issue then. Perhaps it's the ways we do the basic human activities — eating, sleeping, pairing, bathing — that articulate our cultural expectations most clearly. I;m still very much held by the Max Warren quote (though I've never seen it precisely sourced) "It takes a whole world to know Christ"
I do see what you mean -but I'm not so happy with this post -it sounds too close to the arguments that are made against the very concept of universal human rights and in particular against a idea that there are some universal rights for women which are more profound than cultural norms. As Zukowski shows in his book The ‘good conscience’ of Nazi Doctors, the apparent integrity of a person and their belief in the goodness of what they are doing, from the perspective of their value systems, is not a defence against the objective evil of their behaviour. Cultural relativism gets you into all sorts of trouble -female genital mutilation for example has been tolerated in the West for far too long because we bought that argument. Thanks, Rosie, for putting some helpful boundaries around this cultural mixing thing... I agree there are things people get up to in another culture which would certainly be beyond the moral pale — keeping a servant as a slave, for example, as some foreign nationals allegedly do in London. Other behaviours, for example clothing and eating habits, are very likely to be more purely cultural. I was fascinated by the difference between Western and Muslim definitions of "prudish." In between are very grey areas — what do people in our culture make of other people smacking (or threatening) their children? Smacking is easy, because it involves physical violence, but how does one "objectively" define emotional pressure on the child, for example, without bringing in the culturally specific context? The relationship of morals to human rights is easier to describe in the abstract than to put into practice, especially when one human right fully expressed apparently conflicts with another. So human rights turn out disappointingly often to be very hard to universalize — and there's a whole school of philosophers out there who would say that fact alone makes them something less than morally objective. Clearly defined, they make good measuring sticks for behaviour, but surprisingly poor absolutes. I remember getting sucked into a particularly complex and odd family dispute involving two Asian families, in which it was Cultural sensitivity that showed the way, given the complexity and anger on both sides. So, I don't want to absolutize cultural sensitivity as a magic bullet, but without it it's hard to understand, let alone rebuke, morally bad behaviour.